Summer in Japan—cotton kimonos, shaved ice, festivals, fireworks, and fans! The iconic imagery of Japan’s hottest season is all about enjoying summer’s outdoor traditions while beating the heat in style. 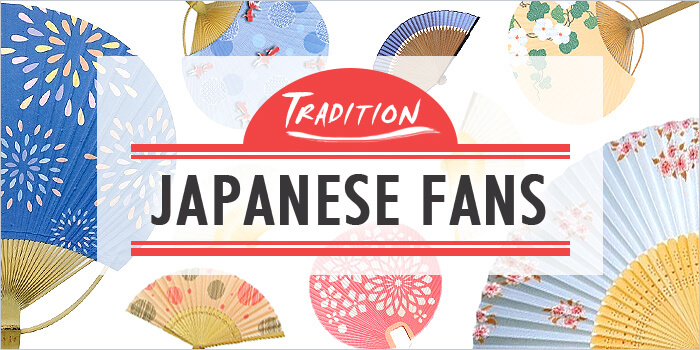 Keep reading to find out more about Japan’s love of fans and some tips on what to consider when choosing the perfect fan for you! 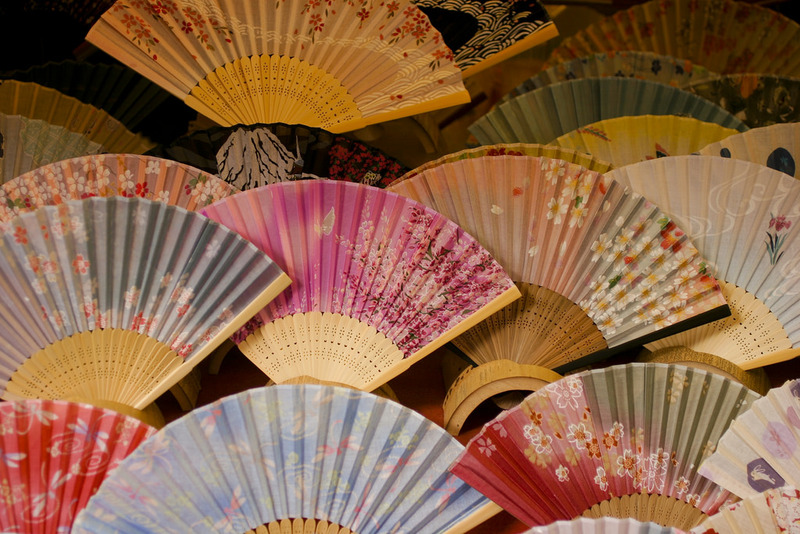 Hand fans in Japan have traditionally had many uses beyond just being fashion accessories for keeping cool; they were also used as weapons, to give signals during battle, or to denote a person’s rank. Today, they are still used in Shinto ceremonies, and in kabuki, noh, and rakugo performances. And despite modern advances in technology over the last 100 years, the simple traditional hand fan remains popular in Japan. There are two basic types of Japanese hand fans in use today—uchiwa and sensu. Uchiwa are rigid, non-folding fans that were brought to Japan from China in the 5th century. At first, uchiwa were used in ritual ceremonies. They were also used by nobles and the Imperial family to shield or hide their faces in public. Although modern uchiwa are mostly rounded, these early fans had a rectangular shape. Marugame Uchiwa from Kagawa Prefecture, Bosyu Uchiwa from Chiba Prefecture, and Kyo-Uchiwa from Kyoto are the most famous types of Uchiwa fans. Unlike the rigid uchiwa, sensu are foldable fans that were invented by the Japanese court in the 6th–9th centuries. Because paper was so expensive to produce, records were often kept on slats of wood. According to historical records, someone in the court decided to bind the slats at one end and string them together on the other, thus accidentally creating the early folding fan. Soon the fans became more intricate, taking on various symbolic meanings and purposes; and later they were exported to China, eventually making their way to Europe by way of India. By the 17th century the Queen of England could be seen carrying a sensu-like hand fan. Traditionally, uchiwa are made using high-quality bamboo; the handle begins as a solid piece but then splits into ribs, spreading out to support the paper or cloth material. Classic uchiwa often have summer-themed designs hand painted on them, such as water and wind motifs, seasonal flowers, or goldfish and fireworks reminiscent of a Japanese summer festival. Nowadays, it’s much more popular to see uchiwa made from plastic, featuring your favorite anime characters, j-pop stars, and popular Japanese brands. Sensu are made using pleated paper, silk, or cloth attached to foldable sticks. The sticks are traditionally made of wood or bamboo, although inexpensive fans are often made of plastic. Cypress wood was a choice material for early sensu, but another popular choice for wood is sandalwood, which adds a fragrant aroma as you gently fan yourself. 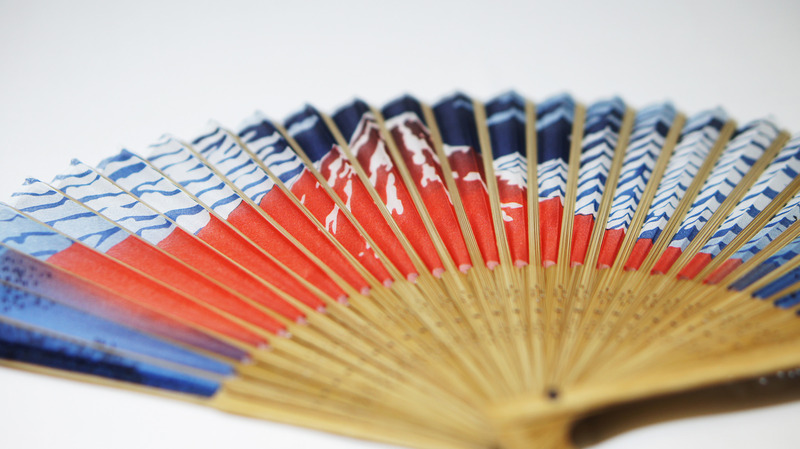 While both styles offer a fashionable way of cooling yourself, some care should be given in choosing the right Japanese hand fan for your needs. 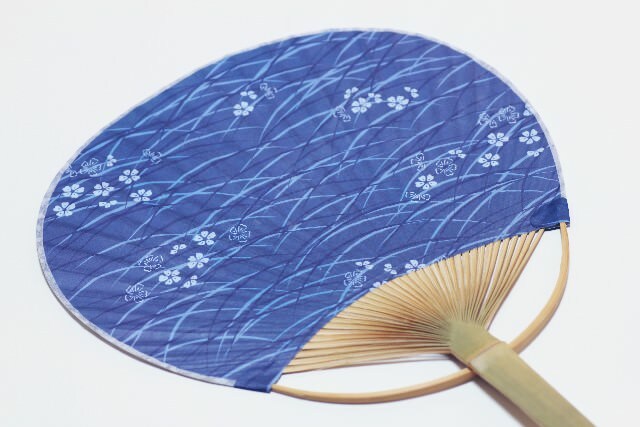 Uchiwa offer a wonderful breeze but are not easy to safely store when out and about; this is why you’ll often see this style of fan carefully tucked in the back of a summer kimono’s obi (belt) when not in use. The sensu’s design, on the other hand, makes the fan much easier to slip into your purse or pocket, and is therefore a more popular accessory for travel. Other considerations include the materials of your fan. Paper fans are better suited for slightly breezy but humid weather, while cotton and silk fans are more durable and can be used throughout the season. Wooden and plastic fans offer the greatest durability; though all-wooden fans can be too heavy for extended use, while plastic fans lack the beautiful Japanese aesthetic that make these functional accessories so attractive. Gently break in your fan. Be very careful when opening and closing a new fan, because the folds are not fully set yet. Over time you will be able to quickly do so, but take care in the beginning. Gently brush off dust or dirt after each use. You can easily stain your hand fan when storing it for later use if not cleaned. Silk or cotton fans can be lightly cleaned with a damp cloth (unless the design is painted on). Gently store your fan. When carrying your fan or packing it in luggage or a purse, be careful not to place heavy, hard, or sharp belongings on top of it as they may cause damage. Hand fans should always be stored in a box or pouch in a cool, dry, dark place when not in use, or displayed on a stand. With Japan’s famously hot and humid summers, the country knows a thing or two about staying cool in style. Pairing a fashionable Japanese hand fan with a bold colored yukata and authentic Japanese sandals will keep you comfortable while turning heads. When shopping for your look, don’t worry about trying to match the colors or patterns exactly. It’s common, for example, to use one of the yukata’s accent colors as the inspiration for your sandals and hand fan rather than the yukata’s main color. 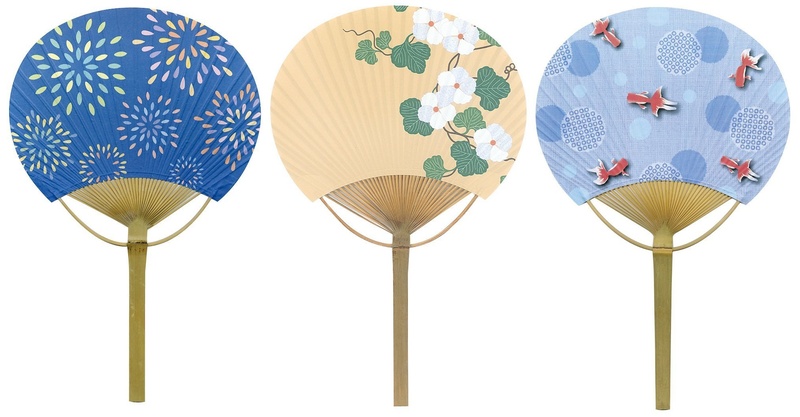 You can find beautiful uchiwa and sensu hand fans at any price, and in a variety of designs (this goes for yukata and Japanese sandals, as well), making them both a beautiful and practical souvenir or gift. Sensu, in particular, also travel easily; and when not in use, both the uchiwa and sensu can be displayed as an elegant accent of Japanese home décor. Whether uchiwa or sensu, FROM JAPAN’s shopping service can help you search for the perfect Japanese fan, order it direct from Japan, and ship it to your door. The top 10 Japanese Items From Japan Of All Time!